A “tank” vehicle is used to carry any liquid or liquid gas in a tank of 1,000 gallons or more. If you wish to drive a “tank” vehicle, you must receive a tanker endorsement. The included online practice test covers all of the material to pass the tank vehicle knowledge test. 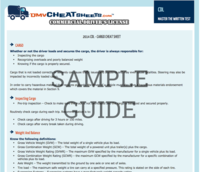 The Tank vehicle knowledge test covers Section 8 of the CDL manual.